Billed as ‘the new shape of cycling eyewear’, the latest addition to the adidas Sport eyewear Sports Essentials line, the lightweight Zonyk Aero Midcut, claims a stable fit and clear vision ‘making it easier than ever to navigate quickly changing road and weather conditions’. With its ideally shaped lenses that offer a huge field of vision, adidas notes that even the smallest details are visible no matter how quickly you’re moving. The lenses are customizable and available in a variety of options to match rider needs: polarized, mirror, eye fatigue reducing LST, automatically tint adjusting VARiO, and a brand new LST + VARiO combination. 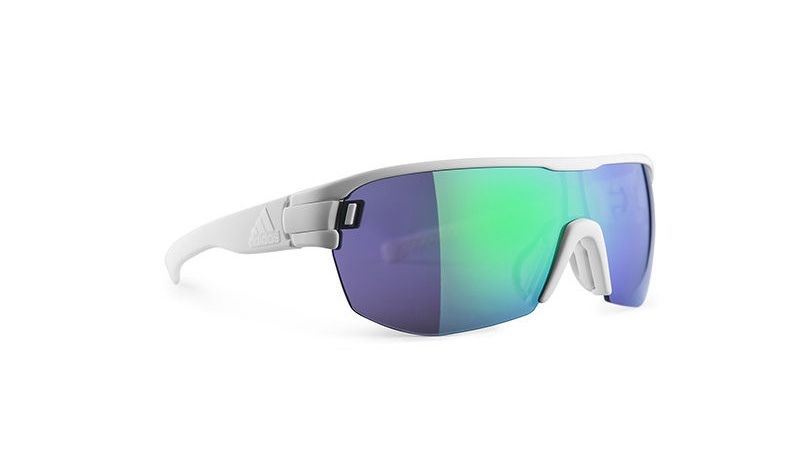 The zonyk aero midcut is available in a pro version, which comes with a removable sweat bar that directs the airstream towards the inside of the filters, aiding the climacool ventilation system and helping to reduce lens fogging. New specifically shaped lenses – for best possible viewing experience. New LST bright VARiO purple mirror filter option – combining eye fatigue reducing LSTTM technology with automatically adapting lens tint. Quick-Change Lens System – quick and easy exchange of the lenses possible. Two sizes – small and large frame options aim to ensure best personal fit and comfort for men and women alike. Traction Grip -stability and comfort thanks to non-slip contact points on the temples. Double-Snap Nose Bridge – comfortable fit and grip thanks to an adjustable nose bridge. Also includes additional extended nose bridge for individualization. TRI.FIT three-position adjustable temples provide best fit and minimize incoming wind and glare. RX ready – accommodates all vision abilities with clip-in inserts. The Zonyk Aero Midcut Pro is available in eight different colour and filter combinations. MSRP starting at US$209. The zonyk aero midcut basic (without sweat bar) is available in twelve different colour and filter combinations. MSRP beginning at US$159.